As a frontend developer, when I want to try a new framework, I want to do something a little more elaborate than the todo-list that everybody has already done hundreds of times … What’s missing about that is data. 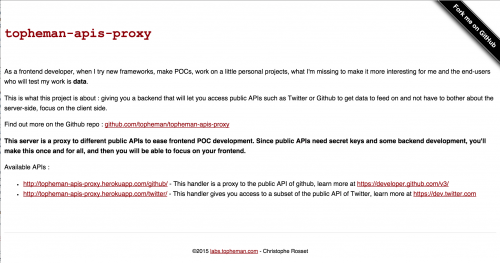 This is what topheman-apis-proxy is about : it gives you access to public APIs to get data to feed on and not have to bother about the server-side, focus on the client-side – install once, configure your credentials and you’re good to go. It is based on expressJS, I already use it for one of my projects.